Any guesses what message he's subtly trying to convey? (Newser) – An Austin Republican's lawn currently features an empty chair dangling from a rope on a tree, along with a US flag. 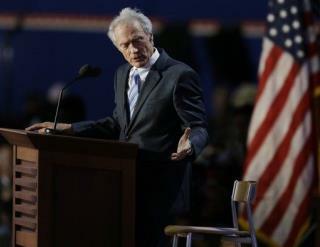 Following Clint Eastwood's RNC speech, it's not a stretch to assume the empty chair symbolizes President Obama, suggesting not-so-subtly a lynching, Burnt Orange Report notes. A similar display appeared in Virginia this weekend. This guy lives not more than a mile from me according to our local paper, the Austin American Statesman. No idea who he was or is until now. Just some brainless bozo, same as if you stepped out of your own house and walked down the street to see something like this. People like this can live on any street, anywhere. I apologize to the nation, and to the world on behalf of Austin, Texas. Know that Austin is a very friendly, accepting, liberal and easy going city, the people in Austin are not like this at all. In fact quite the opposite! Austin is the most liberal city in Texas and always votes Democrat in every presidential election! In fact our gay pride march is tomorrow night and its expected to draw about 50,000 people from all over the state and nation. Interracial couples, gays and lesbians and folks of all kinds are welcome and accepted here. I say this as a 30 year resident of the city, going on 31! And of course, Austin absolutely LOVES Obama and he absolutely has our vote on election day! This is a story? Some lone guy in Texas strings a chair up in his yard? The inference is clear. Many many PUBLIC incidents of lynching Busch got little if any coverage. Oh wait to hang a white President because you want him out of office is freedom of speech, but to do the same for the same reason to a black (albeit half) President is clearly racist. Did they mention this was in a tree in front of the Governor's Mansion in Austin?